"The baloney weighed the raven down, and the shopkeeper almost caught him as he whisked out the delicatessen door. Frantically he beat his wings to gain altitude, looking like a small black electric fan. An updraft caught him and threw him into the sky. He circled twice, to get his bearings, and began to fly north. "Below, the shopkeeper stood with his hands on his hips, looking up at the diminishing cinder in the sky. Presently he shrugged and went back into his delicatessen. He was not without philosophy, this shopkeeper, and he knew that if a raven comes into your delicatessen and steals a whole baloney it is either an act of God or it isn't, and in either case there isn't very much you can do about it." On the other hand, also at the table was Freff, and it was all "Let the chit-chat commence!" First, for those who have come along later, let me say that Freff may be best known in comics circles for his work with Phil Foglio on the delicious but sadly short-lived D'Arc Tangent in 1982. Given that several years have gone by, what's with Freff now? And, for that matter, what's with the name "Freff"? What sort of weird acronym is that? Well, it's not an acronym; it's actually his middle name. 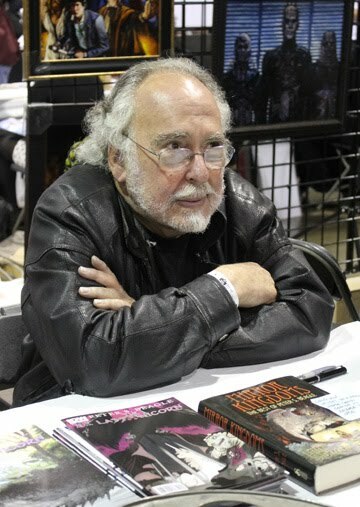 He's Connor Freff Cochran, and one of the things he's doing is helping people today get more of the work of Peter S. Beagle. 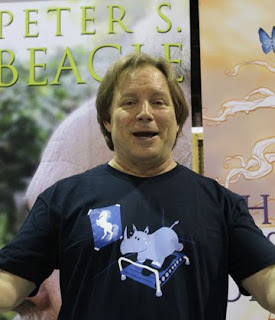 While A Fine and Private Place is the first novel of Beagle's that I'd read, the author is probably best known for The Last Unicorn (1968) - so do note the image on Freff's T-shirt. Among other projects (and I bought, not only the 2007 edition of A Fine and Private Place to savor it anew, but also The Unicorn Sonata , The Rhinoceros Who Quoted Nietzsche , The Line Between , and We Never Talk about My Brother , not to mention the Beagle-edited The Secret History of Fantasy ), Freff told me about "the 52-50 project." And I'll tell you more about that another day, if the creek don't rise and the bunny rabbits don't eat all the celery. You're in for a treat, Maggie. Those short story collections are especially full of great, great stuff.